I had to take it easy on this collection this year so I can catch up on my bath bomb collection; but, the rest of the collection is just as fun! They have a banana massage bar, and fun soaps and bubble bars. I love that the collection is funny without being vulgar! Their holiday collections are always limited edition; but, can be found in stores and once in a while a really popular product stays in their permanent collection! Lush Love Boat Bath Bomb ~ $6.95 CAN. It's not any old boat; it's a love boat, baby. Head to the tub with this fizzy yacht and watch it zoom around, leaving groovy pastel colors and a powdery sweet lemon-orange scent in its wake. Sink deep into relaxation, then emerge with delicately scented skin and a brighter outlook. This little love boat is super cute and a return from last year's V-Day collection. I remember really liking this cute little love boat and it had a little surprise of some confetti inside - it left the bath a pretty purple and smelled so fresh! Lush Peachy Bath Bomb ~ $6.95 CAN. If you like big peaches and you cannot lie, this cheeky bath bomb won't disappoint. Pop it in the tub and it'll slowly fizz, releasing juicy grapefruit, fresh peach juice and sweet davana as it goes. Lie back, swoon over the mesmerizing pink swirls of color and emerge feeling peachy keen. 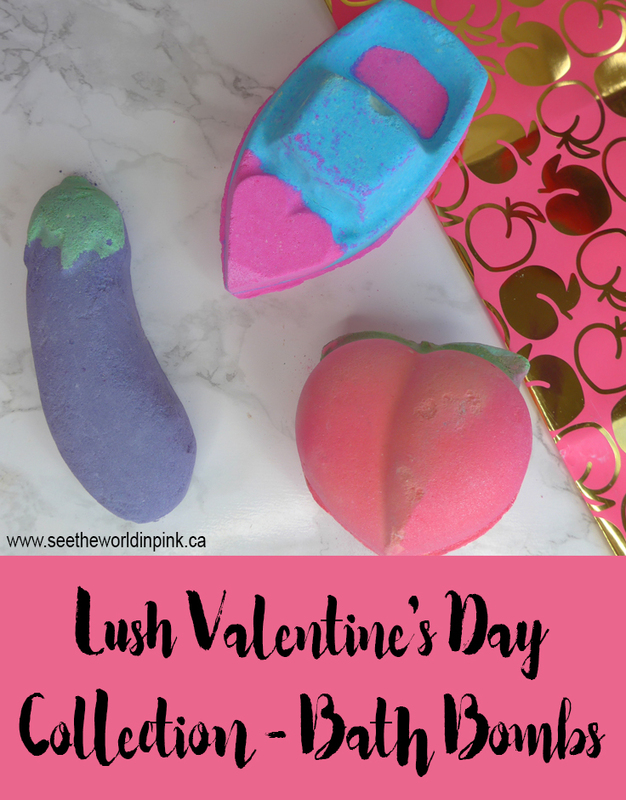 This is so cute and I love that it's such a fun little bath bomb - it smells amazing, I love a peachy scent and the grapefruit adds such a nice touch to this! Can't wait to use this! Also, the 2 of these little bath bombs come in a little set - called Peach and Love and that is where the cute peach wrapping paper comes from too! Lush Eggplant Bath Bomb ~ $6.95 CAN. When words fail us, emojis save the day. So if you're struggling to find the right words for your Valentine this year, this fab fizzer will say it all! Deep purple waters with streams of green and blue set the scene, while uplifting bergamot, ho wood and zippy litsea cubeba keep their energy soaring. Okay, I know some people are not going to love this eggplant bath bomb; but, I personally think this is hilarious! It's funny and playful and that's what I love in a Valentine's collection! It smells good too, so it will be fun to use!